Product code: W1490cc Categories: Sold Items, Sold Rolex Watches. The Rolex GMT Master has such a distinct and iconic look due in part to the additional red GMT hand, but mostly thanks to the brilliant looking two tone bezel as can be seen here in this stainless steel Rolex GMT Master II 16710 Pepsi bezel with Rolex service papers. The red and blue rotating bezel affectionately known as the “Pepsi bezel” makes the GMT look like no other Rolex model and being the GMT Master II, this allows three time zones to be set. Measuring 40mm across plus the Rolex screw down crown, inside is the 31 jewelled automatic Rolex calibre 3185 that was recently serviced by Rolex and comes with its Rolex service papers. Fitted on the Rolex Oyster band that is also in superb condition, the Rolex GMT Master has become such an incredibly sought after Rolex model in recent years and one that is becoming increasingly hard to come by. Tags: Rolex, Rolex 16710, Rolex GMT Master II. Stainless steel Rolex GMT Master II 16710 Pepsi bezel with Rolex service papers. Originally designed by Rolex in 1954 for the Pan Am pilots, this particular one was made in 1999 and features the iconic red and blue rotating bezel affectionately known as the “Pepsi” bezel whereas the red and black bezel is known as the “Coke” bezel. The difference between the Rolex GMT Master I and the Rolex GMT Master II is that with the GMT Master II you can rotate the hour hand around quicker to set the date more rapidly as well as being able to set three time zones as opposed to the Rolex GMT Master I which can be set to display two time zones. The addition of the red GMT hand combined with the red and black bezel go a long way in giving it such a distinct look. 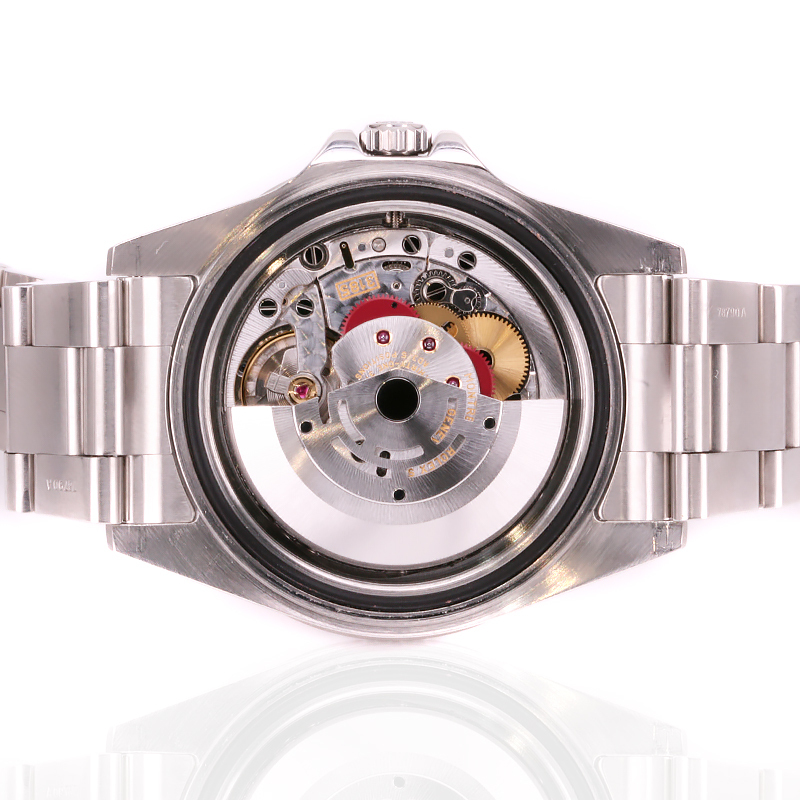 The Rolex automatic calibre 3185 has 31 jewels and a power reserve of fifty hours. The Rolex GMT Master II 16710 has become an increasingly difficult watch to get in recent years and one of the most highly collectable Rolex watches.